Our books are more than just “books” – they’re practical guides to help you maximize the quality of your life by adding or deepening a spiritual dimension. The authoritative wisdom BBT books contain is timeless and universal; the depth and breadth of the spiritual knowledge they represent is beyond anything else available. Many of our readers become so inspired by what they’ve read that they want to share these unique and compelling teachings with others. Writing and distributing transcendental texts is at the heart of spiritual culture. To be able to make spiritual knowledge available to others – however you’re able to do it – gives a satisfaction that can’t be compared to anything else. 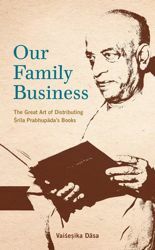 To encourage and inspire our readers to share what they’ve read, the BBT has recently published Our Family Business, The Great Art of Distributing Srila Prabhupada’s Books, by Vaisesika Dasa, an inspired individual who has been successfully distributing BBT books since the early 1970s. In this book, the author makes a compelling case that, while we may benefit from reading books like the Bhagavad-gita and Srimad-Bhagavatam, those benefits are compounded many times over when we take the additional step of passing what we’ve read on to others. We cannot recommend this book highly enough, especially to those among us whose lives have been touched by reading – and putting into practice – the teachings found in the books of the Bhaktivedanta Book Trust. Benefits – What’s in it for me? What can I expect in return for sharing transcendental books with others? History – How have BBT books been so widely distributed? How, in a few short years, did the BBT become the largest publisher of books on the most time-honored and comprehensive spiritual philosophy in the world? Service to humanity – How does giving people spiritual knowledge benefit them? Practical tips – I’d like to share this knowledge by distributing BBT books. How do I go about it?